Found one file extension association related to Alienware Command Center and 1 file format developed specifically for use with Alienware Command Center. Alienware Command Center houses all of the custom software for Alienware notebooks. By placing programs like AlienFusion and AlienFXTM in a single, user-friendly interface, you gain more control over your system. 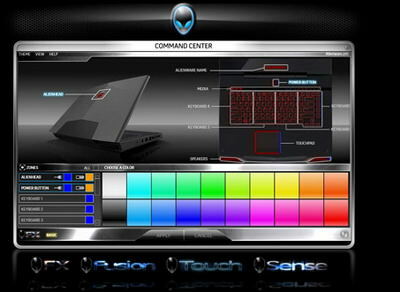 AlienFX — This unique lighting system lets you choose from an array of color and transition effects across six distinct zones, including the AlienwareTM logo, keyboard, touchpad and more. AlienFusion Power Management — Access your notebook’s power-management controls so you can decide when you need maximum performance or when to scale back for more everyday programs,, which can increase energy efficiency. AlienTouch — Take advantage of advanced touch pad controls with AlienTouch. Customize your touch pad’s sensitivity to prevent accidental contact, modify “tap and drag” functions and even activate virtual scrolling to enable vertical and horizontal scrolling with just a brush of your finger. AlienSense — This facial-recognition software identifies numerous distinguishing features, utilizing the webcam to read and verify biometric measurements that cannot be faked or stolen like a typed password. If you need more information please contact the developers of Alienware Command Center (Dell, Inc.), or check out their product website.